Questions? Comments? Sell us your stuff? Despite the cover photos, these modules have nothing to do with the Arnold Schwarzenegger Conan movies. 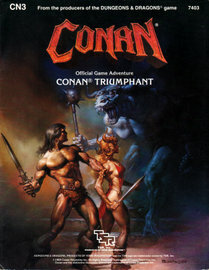 "This game adventure is the first of a series of Conan adventures. Unlike other adventures produced for the AD&D game, this one is based on published stories. 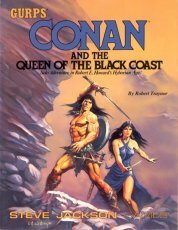 These stories, written by Robert E. Howard and others, describe the life and adventures of the barbarian, Conan. All the stories are set in the world of the Hyborian Age. 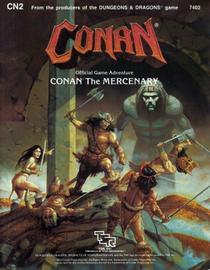 This adventure is designed for four 10th to 14th level player characters, specifically Conan, Juma, Valeria, and Nestor. These adventurers are characters from the Conan stories. On pages 29-30 of the adventure, each character is given statistics and a complete description to aid players in role-playing these heroes and heroines. Players may also use their own characters in this adventure. However, the Hyborian World is different in some ways from normal AD&D worlds, and the characters given are those most likely to provide several sessions of enjoyable play. This adventure is set in Howard's Hyborian Age. As DM, you must prepare yourself and your players for some differences from the type of world presented in the AD&D rules. These differences do not affect basic rules, but will change the approach players take to the adventure. Carefully read the AD&D Rules in Hyboria and The Hyborian World sections before beginning play. Describe the Hyborian World and its differences to the players and give them the map of Hyboria. The inside of the adventure cover is a detailed map of the area around the Vilayet Sea. This map is for your use." "Thoth-Amon, the greatest living sorcerer of the Hyborian Age, threatens the peace of Aquilonia. His tragic mistake is that he threatens Conan also, for Conan is now King of this mighty land. 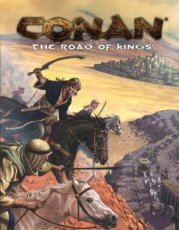 Conan and his companions, Pelias, Prospero, and Nzinga journey across the plains of Shem and Stygia to test their will and power against this wicked sorcerer. Battle with them to conquer the evil forces that endanger their land!" This boxed set -- and the three modules that follow -- are a different game, not AD&D. The rules use a skill system similar to that of Marvel Super Heroes. "YOU ARE CONAN, THE MIGHTY BARBARIAN. 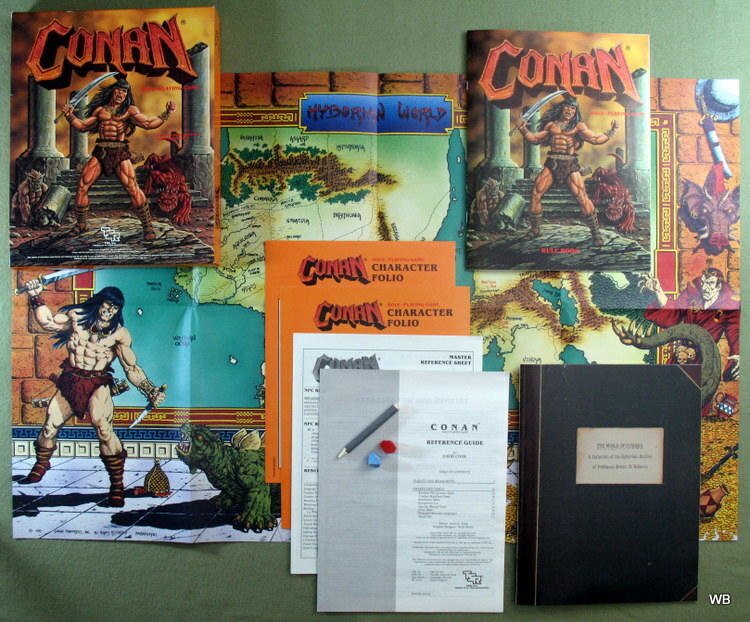 SLASH YOUR WAY ACROSS THE EVIL AND DANGEROUS LANDS OF HYBORIA IN THE CONAN ROLE-PLAYING GAME!! * A full-color map of Hyboria — its countries, cities, rivers, lakes and islands. 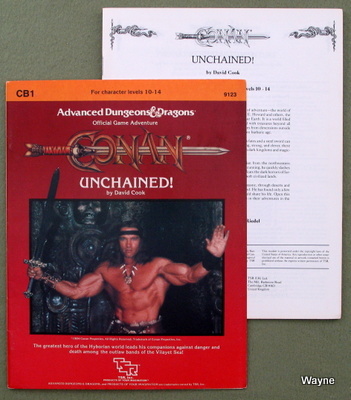 * A 32-page rule book with special rules for creating your own adventures for Conan and companions. * A 16-page reference guide. * A 48-page notebook of compiled notes and information about the lands of Hyboria. "Many Argosseans have been forced out to sea by burdensome taxes and penalties imposed by the king and his court. Most flee to Messantia where a person can lose himself in the streets. Some sign on to merchant vessels. And some become freebooters and buccaneers who sail the western seas. Of those who feed off other's labors, one group is of importance. Although backed by foreigners, the captain and crew are Argossean. Their expedition will take them far past the Isle of the Black Ones, past the domain of the pirates of the Baracha Islands, in search of a lost island kingdom and the untold wealth it contains. Their fame, however, lies not only in what they accomplish, but in one of their crew - a young barbarian. "Fair fortune or foul brought you and your companions to the Barony of Aldoc, infamous for its bloody persecution of mages and the priesthood of any pantheon. But where there's strife there are those willing to hire a band of mercenaries such as yours. Indeed, fate seemed to smile the first week, for the Baron himself sought your services to recover a bauble, a royal symbol stolen by some lackwit. But fate played strange games when the trail led to an underground labyrinth. Now you scrabble through slimy caves, stalked by a band of mysterious masked men, unsure if you will ever again see the light of day. But if any man can succeed, it is the captain of your company. He earned his sword in the frozen wastelands of the north against barbarian and soldier alike. He's one man you'd follow into the netherworld itself, this man called Conan!" The king of Ophir is dying. He refuses to name an heir, believing he will be cured. His nobles are sure no cure will be found and that the country will soon be left without king or heir. The nobles are amassing private armies, plotting for the throne, while the king's army hides. Bandits now raid freely, and the Ophireans are refugees within their own land, fleeing to the safety of the cities. Journey through this land of chaos and confusion based on the Conan the Triumphant book by Robert Jordan." "Black-haired and sullen-eyed was Conan, a thief, a reaver, a slayer, with gigantic melancholies and gigantic mirth. Cycles of legend revolve around his name, glimpses of a world before history, where evil wizards performed dark sorcery, and where the fate of an empire turned on the strength and skill of a single sword. 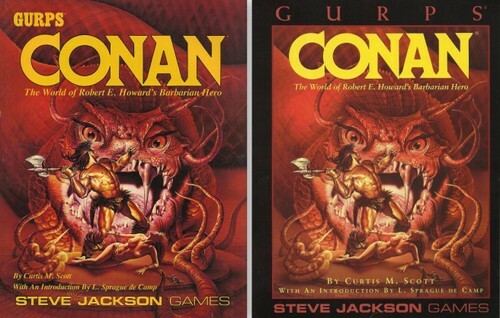 GURPS Conan, a worldbook for Steve Jackson's Generic Universal RolePlaying System, lets you enter the Hyborian Age, when shining kingdoms lay spread across the world like blue mantles across the stars... Zamora, with its dark-haired women and towers of spider-haunted mystery; Zíngara with its chivalry; Stygia with its shadow-guarded tombs; Hyrkania whose riders wore steel, silk and gold; and powerful Aquilonia, the proudest kingdom of the world. • A gazetteer describing the people, customs, laws, religion and mysteries of 34 lands of the world of Conan. • A complete bibliography of 73 currently published Conan stories: names, races and nationalities, places and more. • Maps and historical information for the entire Thurian continent, from the isles of Antillia to the coast of Khítai. • Spells of the Hyborian Age, including the enchantments of the mysterious Black Ring and the potent sorceries of the Book of Skelos. • Rules for generating Hyborian Age characters. • Advice on running a Hyborian Age campaign and how to roleplay the non-human races, including Degenerate Men, Serpent People and Satyrs. • Complete GURPS stats for characters from the Conan saga, including Conan, Bélit and Thoth-Amon. "When the army of Aquilonia marched across Thunder River and into savage Pictland, the tribes of the Picts were driven away. To secure his rich new territory, King Numedides built Fort Tuscelan. This powerful outpost, Numedides thought, would keep the barbarian Picts from striking back. But Numedides' lone fort is not enough to stop the Pict raiders. In recent days, the ruthless natives have burned Aquilonian homesteads, raided merchant caravans, and brutally murdered several soldiers from the fort. For the Picts have united behind a sorcerous leader. The great witch-doctor, Zogar Sag, has sworn vengeance upon the Aquilonian invaders. Even now he is raising a vast Pict horde to crush Fort Tuscelan. You are Conan of Cimmeria, commander of the scouts at Fort Tuscelan. Can you stop Zogar Sag and his army? All of Aquilonia is depending on you to save the land Beyond Thunder River!" "Conan and Bêlít Together on Their Greatest Adventure! Allies, swordmates, lovers... there were no two deadlier pirates in the Hyborian Age than Conan of Cimmeria, destined to be the greatest hero of his time, and Bêlít, savage ruler of the southern buccaneers! Together, they were Conan and the Queen of the Black Coast. • Complete character descriptions for Conan and Bêlít. • Game statistics on new animals and monsters which you can use for your GURPS campaigns. • A map of the Tigress, Bêlít's private vessel, and other combat maps for this adventure." "The Æsir speak of Snow Devil Pass with dread -- and with good reason. Whole parties have vanished there without a trace. 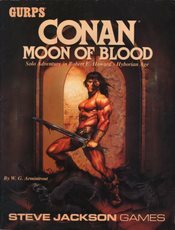 Can the mighty Conan master the bitter cold, the savage beastmen -- and the other horrors that lie beyond? Live the adventure of the glorious Hyborian Age in this solo adventure for GURPS, the Generic Universal RolePlaying System. Based on the story ''Lair of the Ice Worm,'' featuring Robert E. Howards's legendary barbarian, Conan of Cimmeria, it can be played many times without repeating the same adventure. You can relive the adventures of the mighty Conan, or you can send a hero of your own design on the road to fame and glory. • GURPS statistics for Conan at age 23. • Rules for designing your own hero for this adventure. • All the necessary maps and tables. • Game statistics of the people and animals your character will meet." "War has com to the Westermarck. The primitive Picts, led by the powerful shaman Zogar Sag, are marching west to reclaim the land that was once theirs -- aided by sorcery and a traitor from the Aquilonian ranks! Can the mighty Conan uncover the treachery a nd stop the savage attack? Recreate the excitement of the glorious Hyborian Age in this solo adventure for GURPS, the Generic Universal RolePlaying System. Based on the story ''Moon of Blood,'' featuring Robert E. Howards's legendary barbarian, Conan of Cimmeria, it can be played many times without repeating the same adventure. You can relive the adventures of the mighty Conan, or you can send a hero of your own design on the road to fame and glory. • GURPS statistics for Conan at age 40. • Game statistics of the people and animals your character will meet. 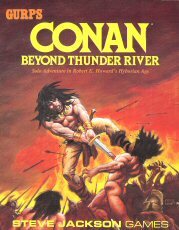 Note: While this game is a sequel to Conan: Beyond Thunder River and you can use the character from that adventure here, is is not necessary. You need only the GURPS Basic Set in order to play this adventure." The 2nd printing (2004) is the Atlantean Edition. 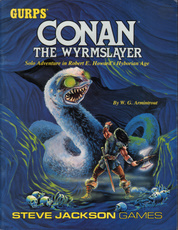 "The golden age of fantasy is brought back to gaming as Conan and Hyboria stride into the realms of gaming once again. 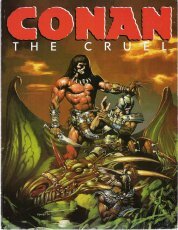 This 352-page, lavishly illustrated full-colour book realises the world of Conan as never before. Exhaustively researched, Conan The Roleplaying Game features new innovations to ensure combat, magic, character creation and development reflect the epic writings of Robert E. Howard. From the shores of the Western Ocean, to the Sea of Vilayet, the countries of Hyboria are explored, detailed and illustrated. The cultures, religions, traditions, legends and more are all explored to ensure this is the most definitive Conan roleplaying game of all time. This complete roleplaying game lets players and Games Masters alike step into the world of the greatest fantasy hero of all time and shake the world of Hyboria. Conan remains one of the most enduring icons of fantasy film, literature and gaming and with this book you can explore the world of Conan in the first comprehensive encyclopaedia of Hyborea." 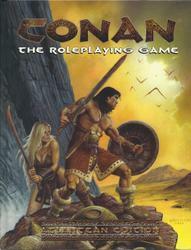 "In Conan The Roleplaying Game, sorcery is a subtle but powerful force. An experienced sorcerer can cast spells undreamt of by wizards in other fantasy games, but he may need to sacrifice a dozen virgins, dose himself up with black lotus, cast the spell and then rest for several days afterwards, rather than simply being able to fire off magic whenever he chooses. 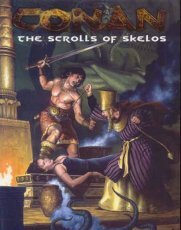 The Scrolls of Skelos is the first supplement for Conan The Roleplaying Game, offering additional sorcery styles and spells; full rules for creating permanent magic and the creatures of sorcery as well as diverse and loathsome religons and an expanded section for Games Masters on handling sorcerers in their games. Conan remains one of the most enduring icons of fantasy film, literature and gaming, with the forthcoming production of a new series of Conan films, as well as new comics and novels about Conan, interest is sure to remain high." "Hyboria, the world of Conan The Roleplaying Game is a rich and varied world setting with a dark underside which is ideal for gaming in. Written by award winning Conan archivist, Vincent Darlage, The Road of Kings is the second supplement for Conan The Roleplaying Game and is crammed full of fascinating details, spanning every Hyborian land, from Aquilonia to Hyrkania and beyond. Wherever players want to set their games, The Road of Kings will provide comprehensive information designed to enrich and enhance the whole Conan gaming experience." 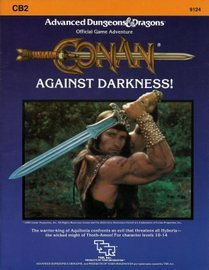 "Conan the Roleplaying Game has been widely accepted by gamers as the most dramatic advance in gaming since the arrival of the d20 system. Filled with innovative ideas and exciting concepts, it’s the most talked about RPG of the year. 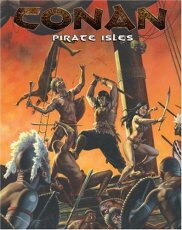 The range of successful Conan releases has only reinforced this, and Pirate Isles continues that tradition. 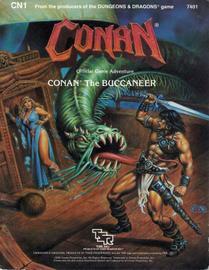 Piracy is a staple of Hyborian fiction, and Conan is regularly involved with various pirate groups during his career. Within the pages of Pirate Isles the reader will find all they need to know about all these bands, from the Red Brotherhood to the Black Corsairs, they are all covered in never before seen detail." 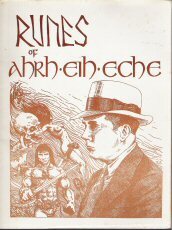 "RUNES OF AHRH EIH ECHE (REH) is the first real collection of letters from REH to his multitude of correspondents. Additional letters have seen print already but we tried to pick material that was a) revealing of his character and life or b) previously unpublished. We selected two sets of 26 letters. One set written by REH to such notables as Howard Rhillips Lovecraft, Clark Ashton Smith, Harold Preece, Farnsworth Wright, Carl Jacobi, R.H. Barlow, and Wilfred Blanch Talman. (Note: Yes there are twenty-eight epistles in RUNES; the last two being from Dr. I.M. Howard to friends and written after Robert's suicide. They're very revealing and portray a deep sense of loss and tragedy). One final note. In the series of letters to Wilfred Talman, REH mentions an article he authored for the April 1931 issue of TEXACO STAR regarding Old Camp Colorado. We have appended that article on to the end of the booklet and would like to thank TEXACO for permission to reprint the article. To my knowledge this is it's first appearance outside the TEXACO STAR." Features renderings of Conan from 27 different artists. 1996. Out of Print. Copyright © 2017, Waynes World of Books. All rights reserved.